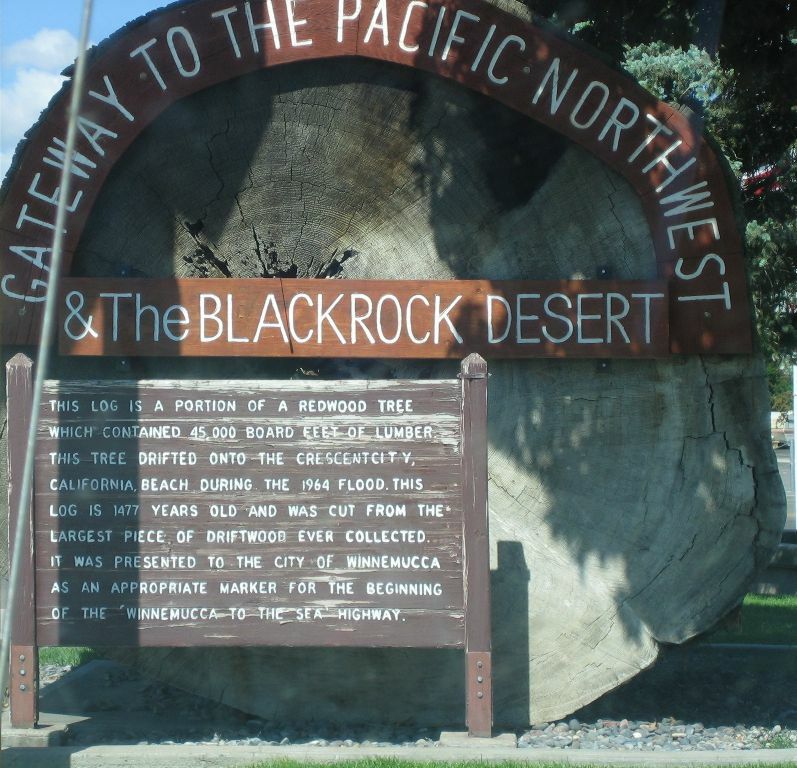 In case you haven't already, make your way over to Outside the Interzone, where Lockwood has posted his first Friday Fragment: photos of graphic granite from a Nevada outcrop between Denio Junction and Winnemucca on the Winnemucca-to-the-Sea Highway, Highway 140 . If you are in Oregon, go east from Lakeview to Denio Junction, and then south; if you are in Nevada, go north from Winnemucca. 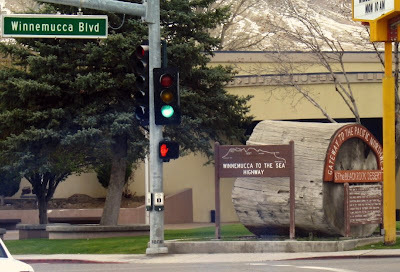 This main stoplight in Winnemucca (you can't miss it; there really aren't that many) is the beginning of the famed Winnemucca-to-the-Sea Highway, which - as you might guess - goes from Winnemucca, Nevada, to the sea: the Pacific Ocean in northwest California. These two signs can be seen better here and here, from the Jed Donnelly webpage. The Winnemucca-to-the-Sea Highway encompasses several Nevada, Oregon, and California highways (map here). 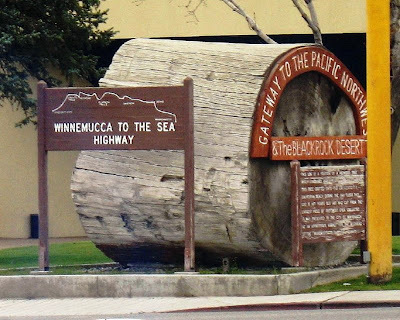 Are you wondering why there is a Winnemucca-to-the-Sea Highway? Read a little about that here (under the US Highway 199 section) and here (near the bottom of the page). I always imagined that if one was living in the inland desert in Winnemucca, one might suddenly or desperately want to escape to the ocean - hence, the highway. It's a great escape route, covering some interesting and not well-traveled territory. I've missed out on the section from Denio Junction to the Oregon state line (the maps show Denio, not Denio Junction, but you don't have to go into Denio unless you are going north, or unless you possibly need gas - although I won't swear that there is gas in either small locality), the section from Lakeview to Klamath Falls, and maybe the section from Lakeview to Medford. There is gas in Denio Junction, along with a restaurant, grocery store, bar, post office, and gambling... all in one garage-sized building. For those on field trips, the happiest thing to see is the waternfaucet outside. I do love those little tiny towns. The Nevada stretch of 140 east to the OR border was a close second for my choice of favorite places to do fieldwork- specifically the Virgin Valley area, maybe 20-25 miles west of Denio. More on that some other time. Always good to know where in Nevada you can get gas, in case you happen to be passing through. 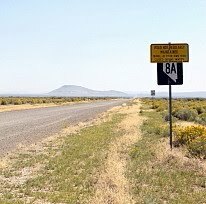 In 1940, US Highway 95 superseded S.R. 8 from Winnemucca to McDermitt, but that section of 8A from Highway 95 to Denio existed until it was superseded by Highway 140 in 1968. CPA: An Oxymoron or Not?